If you would like to see over 700 exhibits featuring some of the latest remodeling innovations then you are definitely going to want to join us tomorrow through Sunday at the NARI 52nd Annual Spring Home Improvement Show. 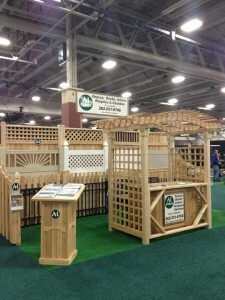 We’ll be there showing off some of our Northern White Cedar fences, gazebos, and pergolas in an effort to “put a little love in your home,” which is the theme of this year’s show. The exhibits aren’t even the only attraction. This year there will also be a whole lot of educational seminars that are run by both national and local celebrity experts. For example, Capt’n Bob and Arlo, who are the hosts of Wisconsin Hot Rod Radio will be appearing in the “Get Your Motor Running” garage display on February 15 from 10:00 am to 1:00 pm, and again that day at 2:00 pm till 5:00 pm. They’ll also be presenting Sunday from noon to 3:00 pm. Admission is just $5 in advance or $8.00 at the door. Seniors can get in for $4 at the door on Thursday and $5.00 all other days, even at the door. Children 16 and younger can get in for free. You can also get in for free if you have a military ID. It’s being held at the Wisconsin Exposition Center at State Fiar Park. So stop by, say hi, and let us know you learned about the show right here on our blog! If you’d like to learn more about the show, you can click here and here.